Cllr. Andrew Wilson, Debra Green, CEO ROC, Roy Beggs MLA. The Jubilee Hall in Carrick was “buzzing with enthusiasm and positivity” at last Tuesday evening’s “Roc Conversation” event. Tickets were sold out for the session which was organised in a bid to tackle social issues in the town supported by Mid and East Antrim Policing and Community Safety Partnership and borough council. Also in attendance were representatives from the PSNI, schools, churches, statutory agencies, community and voluntary groups and Northern Ireland Fire and Rescue Service. Members of the community came together to discuss the specific needs of their community and explore practical ways of meeting those needs. The ROC Conversation, funded through the Mid and East Antrim PCSP small grants programme, identified a number of needs and issues within the community such as isolation, mental health, youth boredom and anti-social behaviour and a need for community facilities and volunteers. Ulster Unionist Cllr. Andrew Wilson, former chairman of Mid and East Antrim PCSP, said: “The ROC Conversation was extremely well attended. We looked at what we do well in the Carrickfergus community and also explored the potential gaps there are to work on. “In my specific group, we identified loneliness and a lack of a sense of community, as issues that could be addressed by inter-generational work. “The conversation should be the starting point of empowering local people and encouraging partnerships between statutory agencies, the community and churches. Ulster Unionist Roy Beggs MLA said “Having assisted Redeeming Our Communitites (ROC) to come to Carrickfergus, I was delighted with the turn out and the positive atmosphere at the Town Hall meeting. Speaking ahead of the meeting, chairperson of Mid and East Antrim PCSP, Cllr Paul Sinclair said: “PCSP are delighted to be funding the Carrickfergus ROC Conversation event through our small grants programme. “The event will focus on addressing anti-social behaviour, reducing crime and fear of crime as well as building confidence in policing. 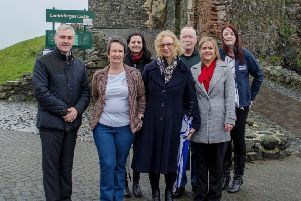 Keeva Watson, ROC regional development manager, Northern Ireland, said that the event had been attended by 141 people who “want to create a positive Carrickfergus”. She indicated that 58 people have expressed an interest in forming an action group.